This is a cassette-only posthumous compilation put together by the Australian Friends of Fairport which became available in 1988. It includes out-takes from Sandy as well as some Fairport material and a few bizarre extras. Lonnie Donegan: Who Knows Where the Time Goes? Judy Collins: Who Knows Where the Time Goes? 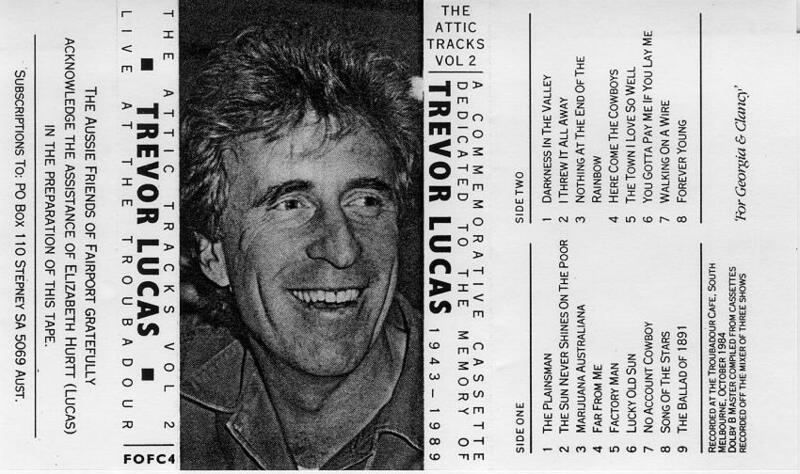 This cassette is exclusively dedicated to Trevor Lucas. Sandy and Trevor have been playing together both in Fairport Convention and Sandy's own band Fotheringay. 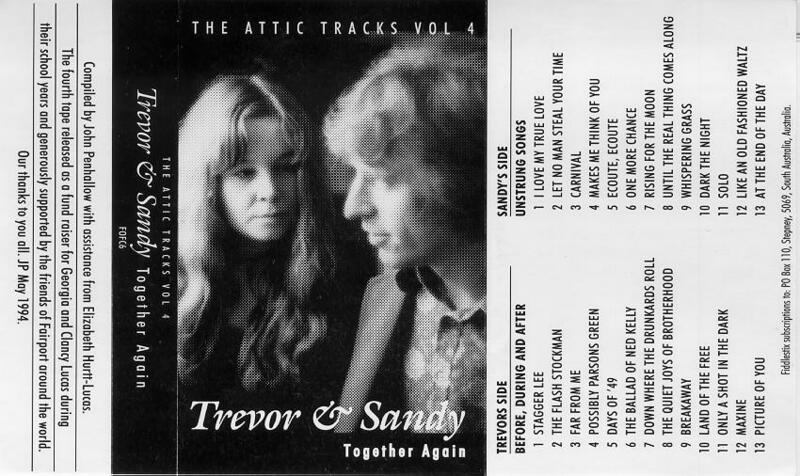 Trevor's powerful voice contributed considerably to the sound of the Rising for the Moon and Fotheringay albums. It was recorded live at The Troubadour Cafe, South Melbourne, in October 1984, with the exception of Darkness in the Valley which was recorded at the same venue in 1982 or 1983. 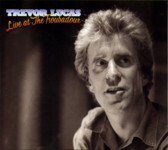 Trevor is accompanied by Fred Kuhnl on bass guitar and Steve Groves on lead guitar, both from an early Bushwackers line-up. This is a cassette-only posthumous compilation put together by the Australian Friends of Fairport which became available in late 1989. Sandy's last concert at the Royalty Theatre, London, on November 27, 1977. 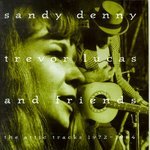 This is the biggest band that Sandy ever fronted, consisting of Dave Mattacks: drums; Pat Donaldson: bass; Trevor Lucas: acoustic guitar and vocals; Phil Palmer and Rob Hendry: lead guitars; Pete Willsher: pedal steel; and Sandy herself on piano and acoustic guitar. The Royalty Theatre live version of The Lady appears on the Who Knows Where the Time Goes? boxed set and all these plus six more titles in an overdubbed, remixed version on the 1998 Gold Dust - Live at the Royalty album. 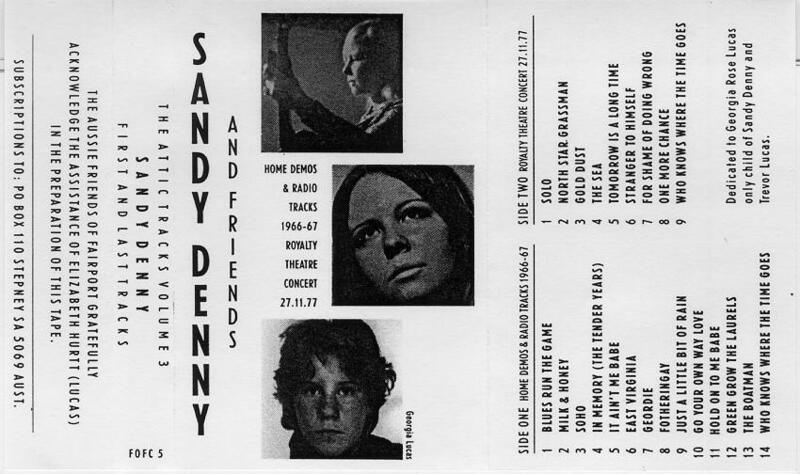 This tape only collection was issued in 1994; one side features Trevor Lucas (with and without Fairport) and the other side features Sandy Denny. Most tracks are from the Attic Tracks cassette compilations. The CD has a nice booklet with photographs and a little bit of history.